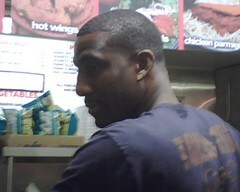 A bunch of us saw Amare Stoudemire at a pizza joint in Scottsdale on March 1st, 2008 around 3 AM. He seems like a nice guy but he didn't want any pictures taken (my bother in-law was bummed by that). I assume that was strategic as he had a game that very day, and I'm sure he didn't want his picture posted on the front page of some tabloid mag spreading rumors. By the way, he ordered a pizza, waited for a woman he was with to use the restroom, and left (very normal). This guy is massive and ripped! His hands are the size of both of mine put together. Game Results: 76ers 119; Suns 114. Stats's stats: 11 for 21, 26 pts, 8 boards. I was at the game. Andre Iguodala took it over. He had 32 points and was 15 for 23. Thank's JJ for the close-up!